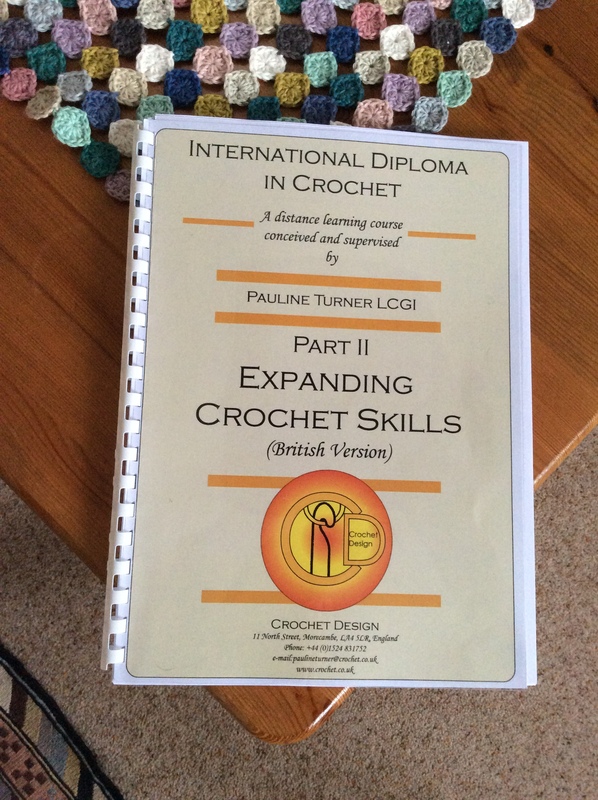 Broomstick crochet is one of the techniques required for the International Diploma in Crochet. 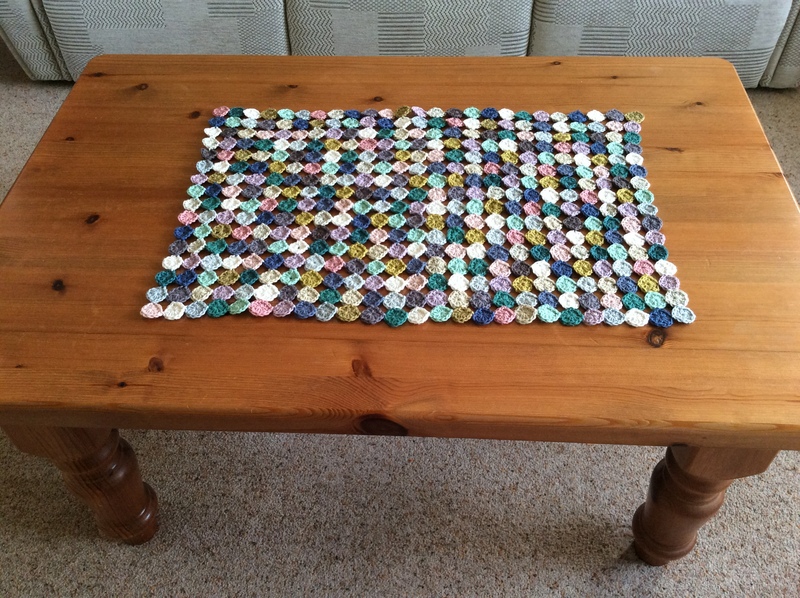 I had been putting it off as it looked a bit awkward but, in fact, it’s not too bad at all as it turns out. 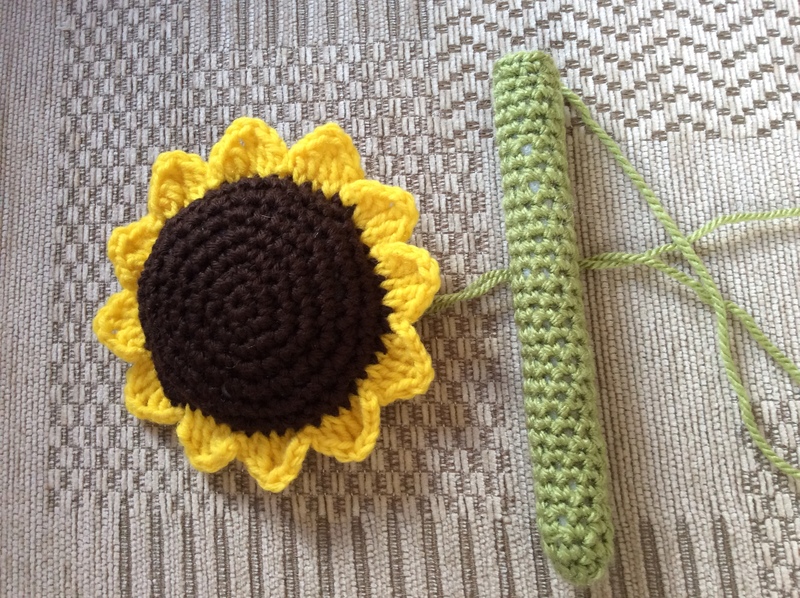 You use a normal crochet hook and a huge 15mm knitting needle: loops are placed on the needle and then crocheted off in groups using double crochets. 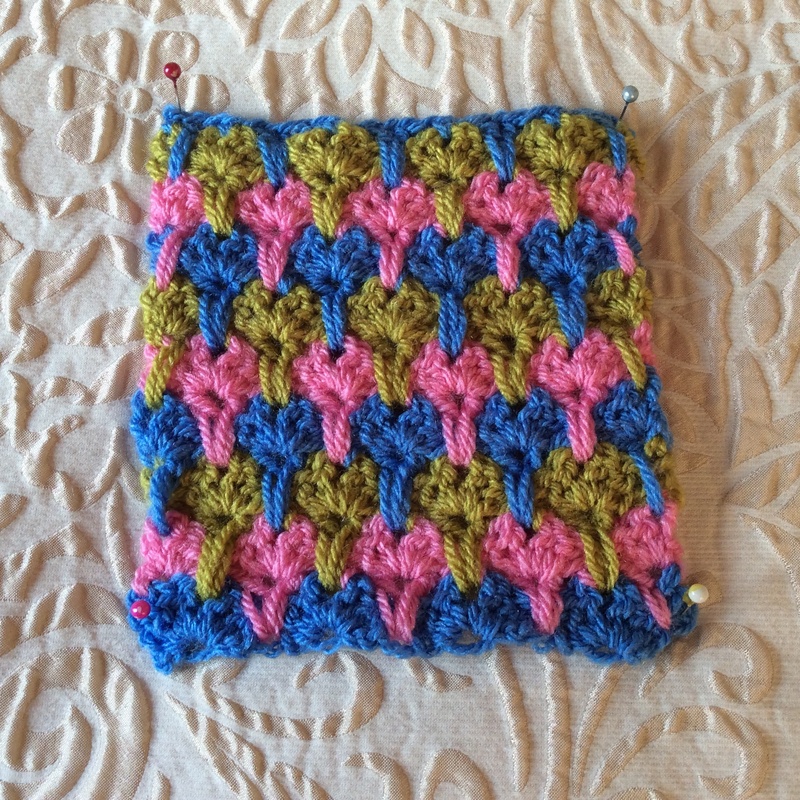 The second sample shows that it is possible to incorporate treble crochet between the rows of broomstick ….. 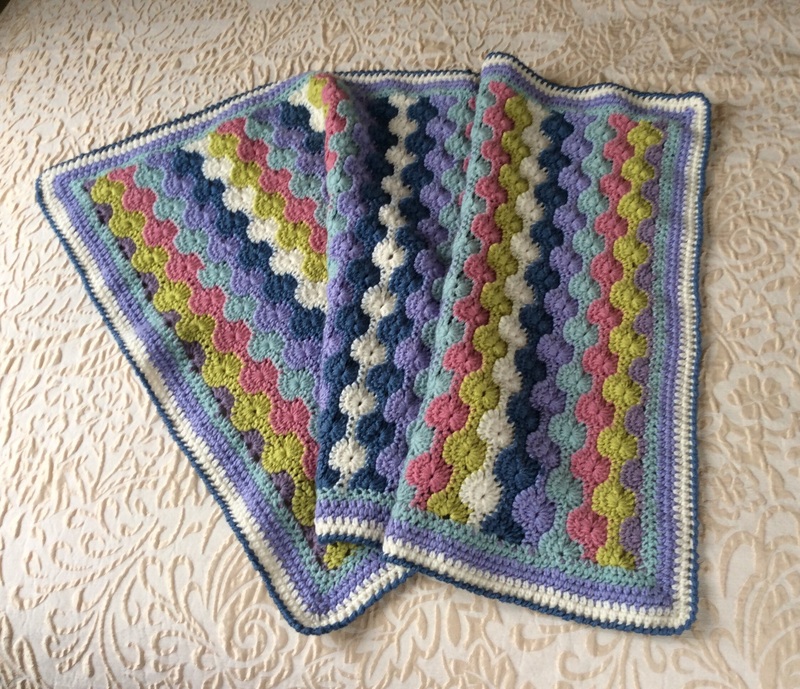 I also had to show that I could use the same technique in a full size item so I used some gorgeous DK sock yarn bought in the USA to show off the open stitches. 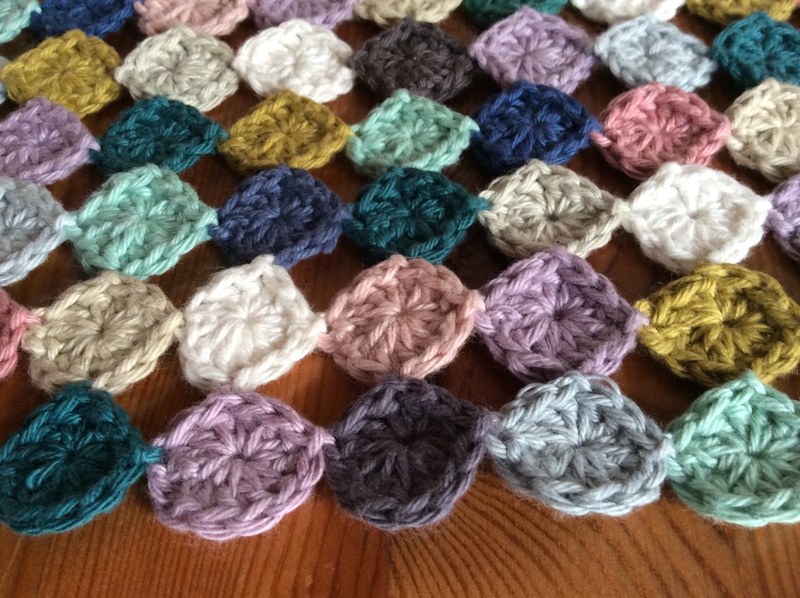 A while ago a friend brought me a lovely pack of Scheepjes cotton in stonewashed colours. As they were mini balls I had no real plan as to what I would make but then, last week, I noticed the yo-yo stitch in a magazine. 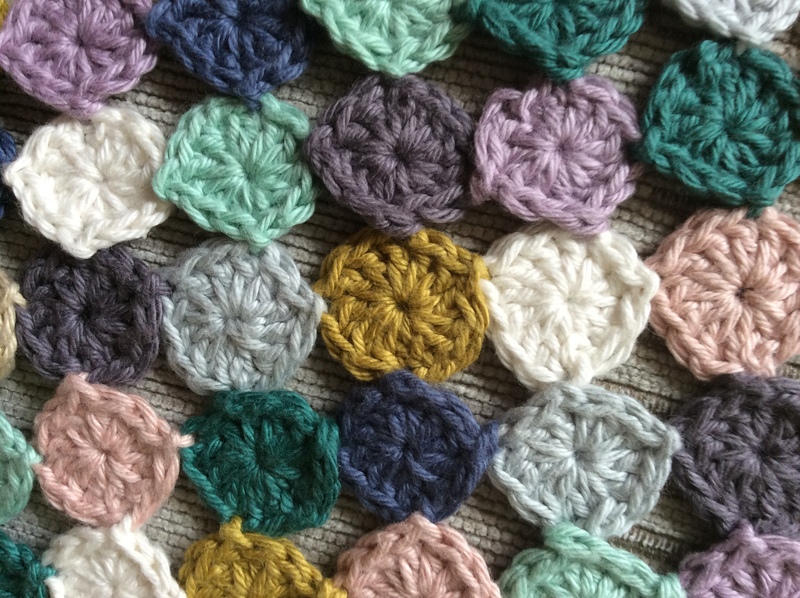 I’d never met the stitch before but it looked as if it would work well in the different colour cottons which are similar in tone to the Turkish rug in our lounge and I could just visualise a coffee table centre to coordinate. 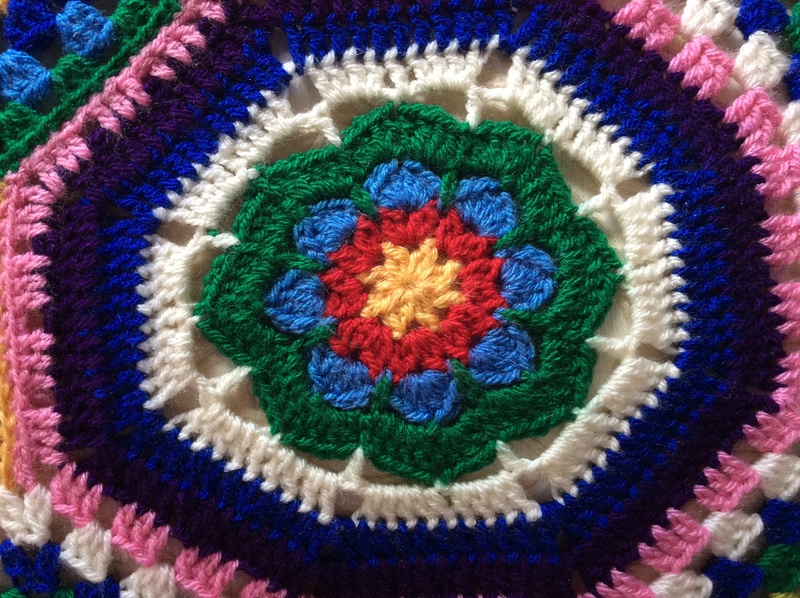 Apart from the obvious nuisance of having ends to weave in after every little circle the pattern is effective and I’m loving the way it is working up ….. The other good thing about this project is that it is very portable and as we have quite a few trips planned it should grow on our numerous journeys. Cotton is cool for working on hotter days as well so it will probably come to Greece with me in a couple of weeks. 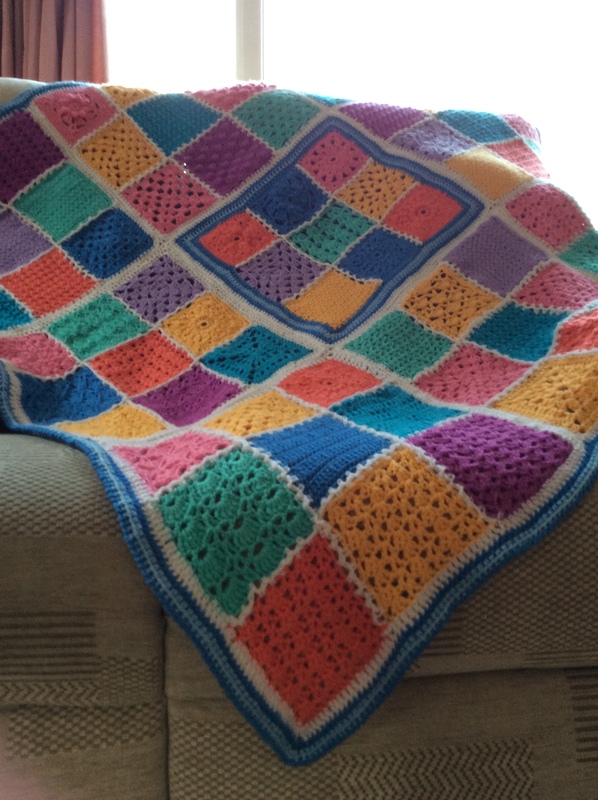 I hope you all have some “cool” crochet on the go for the days ahead. 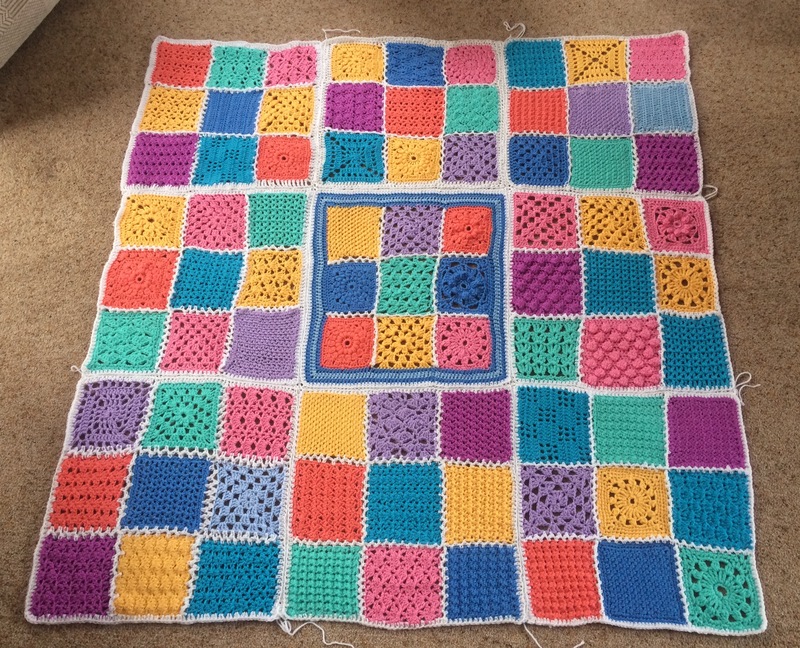 Crochet and/or knitting as therapy is being advocated more and more regularly at the moment – having included a feature on the health benefits of these crafts in our book, The Woolly Prawn in 2012 my daughter and I are encouraged to hear of any real initiatives to promote this. 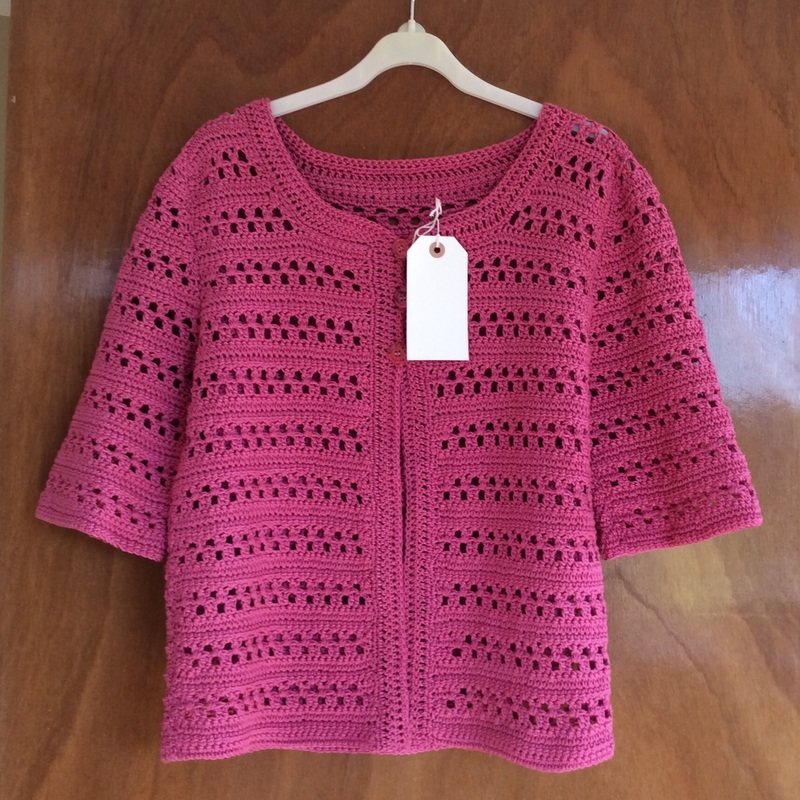 Those of us who enjoy knitting and crochet know the benefits. Let’s spread the word wherever we can. A very special little girl that I know who loves musical theatre has recently auditioned and been chosen to play one of the daughters in Fiddler on the Roof. It will be performed at the Bristol Hippodrome in October and, needless to say, there is much excitement in the air. Now, any of you who are grandmothers will, almost certainly, identify with being asked for help with fancy dress costumes and the like for little ones going to parties or performing somewhere. Believe me I’m rubbish at sewing and have never been much good at fancy dress. 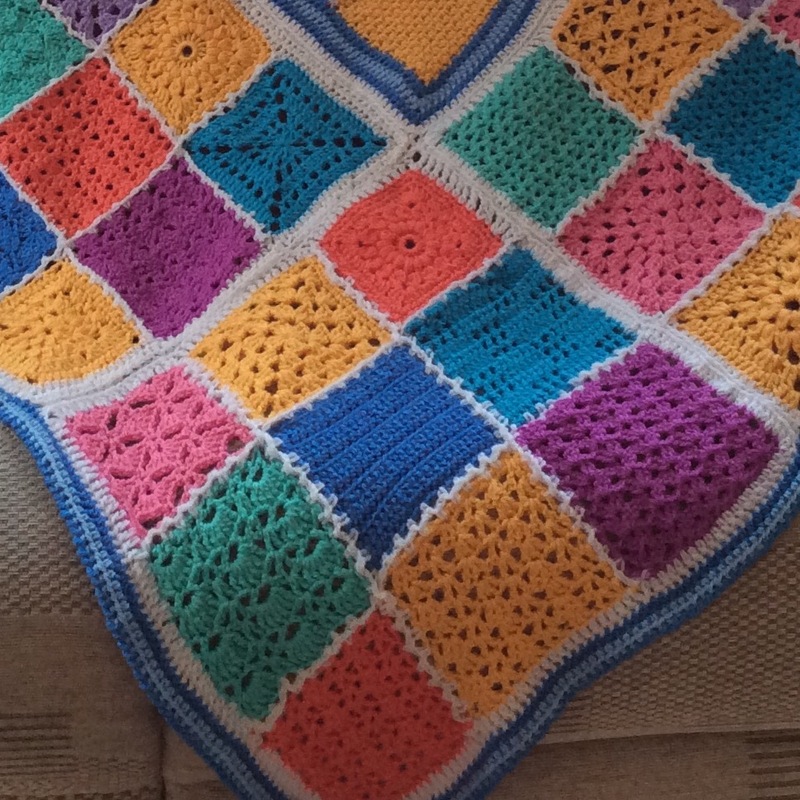 On this occasion there’s a difference though as the costume designer at the theatre wants the girls to wear crocheted or knitted shawls and I am delighted to have been asked! 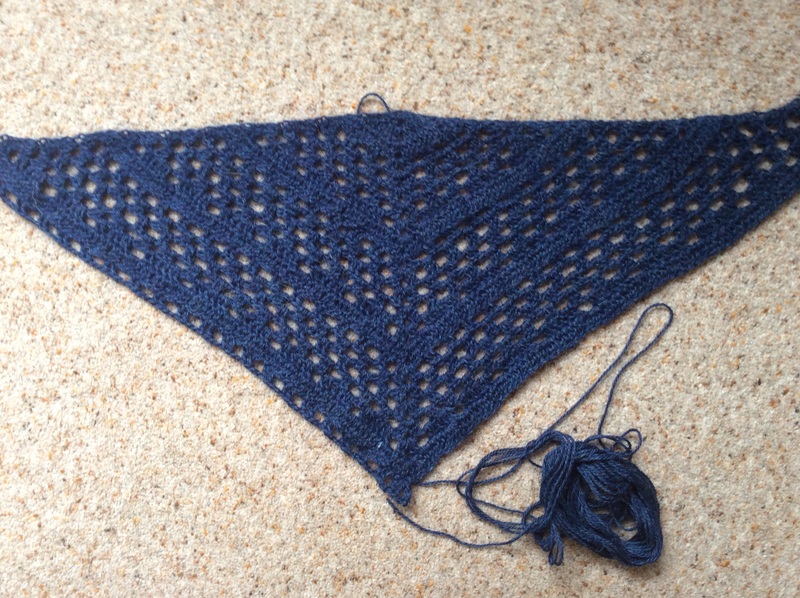 Some patterns have been suggested but as long as the shawls appear authentic – plain, darkish colours and look as if they would have been worn for warmth – any triangular design should work. 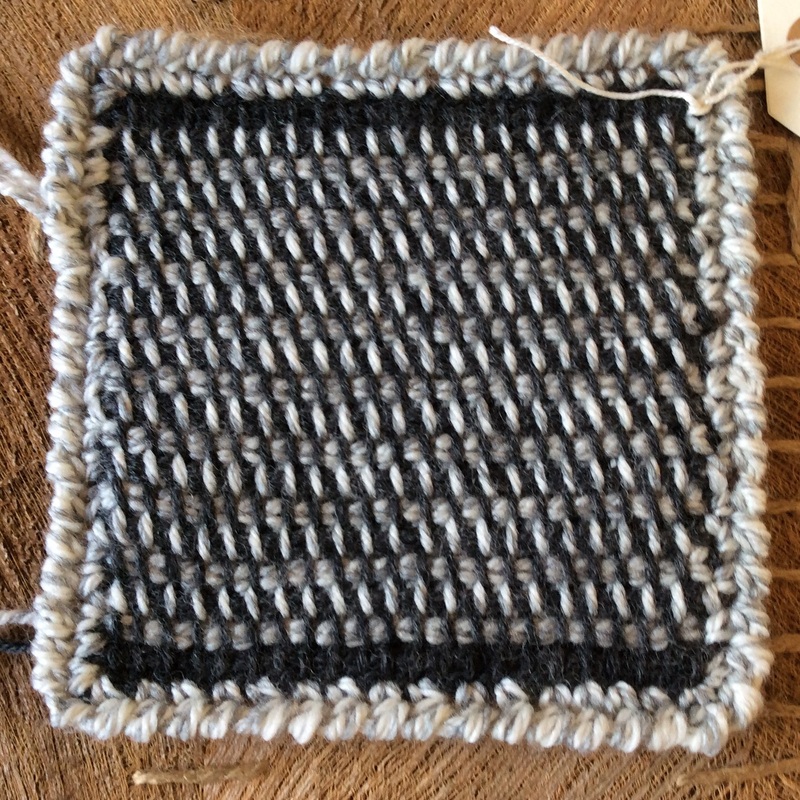 So, I have been trying out a couple to see how the yarn drapes and what the resulting fabric looks like – it’s great fun! 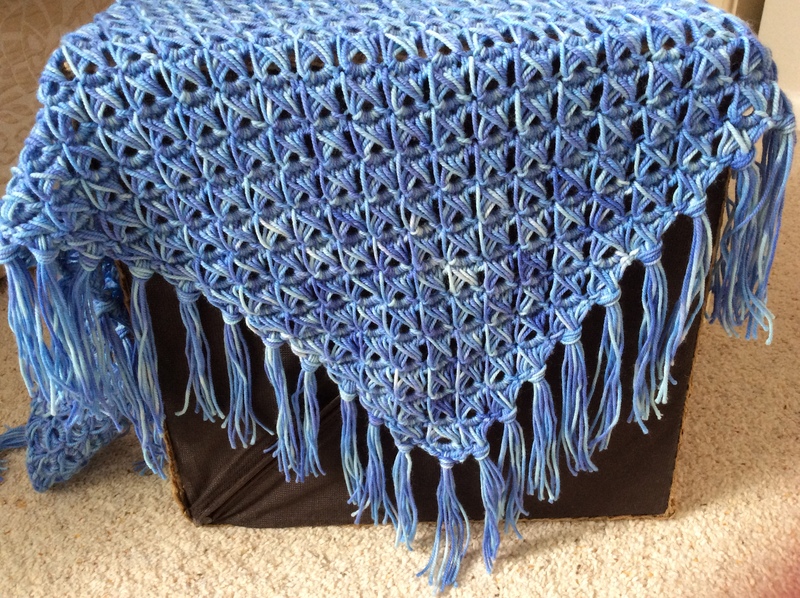 I think I could get “hooked” on shawls! Finally decided on the Dixie Charm since it is a mix of lacy and more solid fabric without being too heavy for little shoulders. 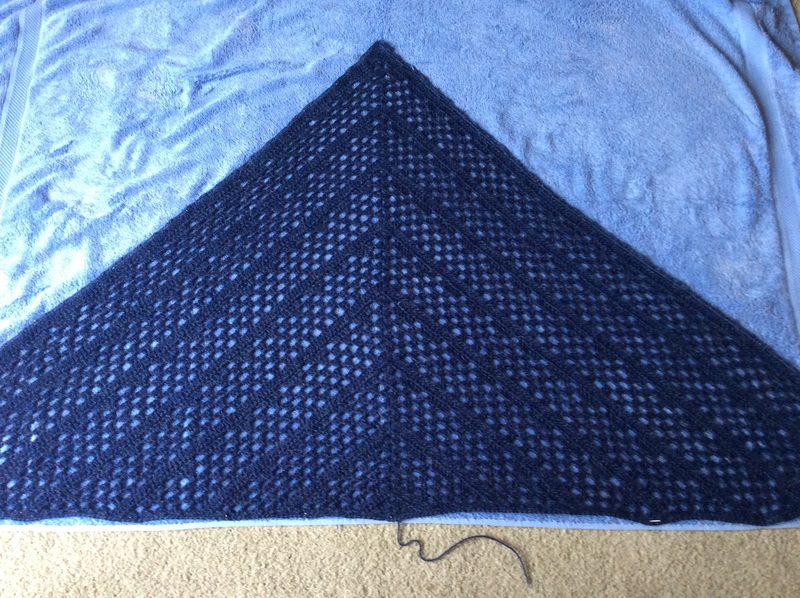 So, over the last couple of weeks I have been working on this one and ta-dah, here it is …..
very blue in the blocking! 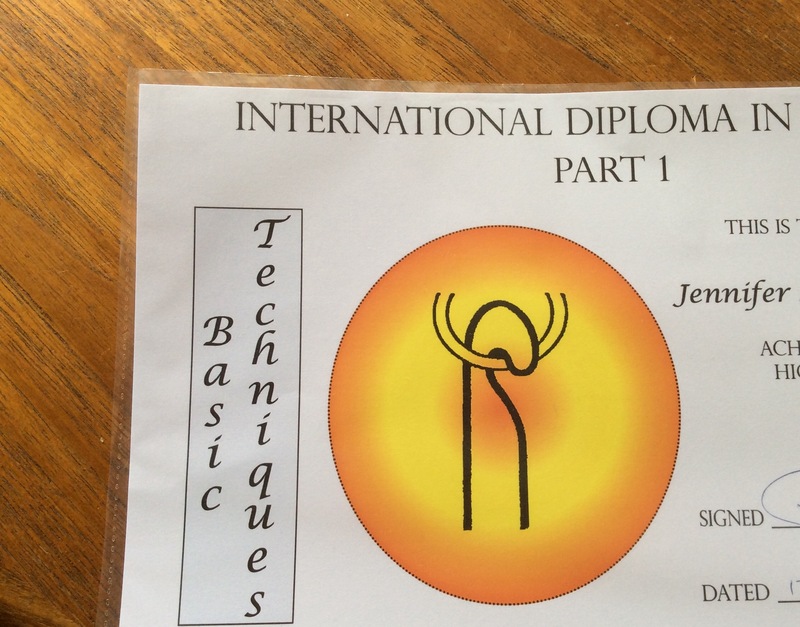 My progress on the IDC had stuttered a little when my mentor was unable to do any assessing. 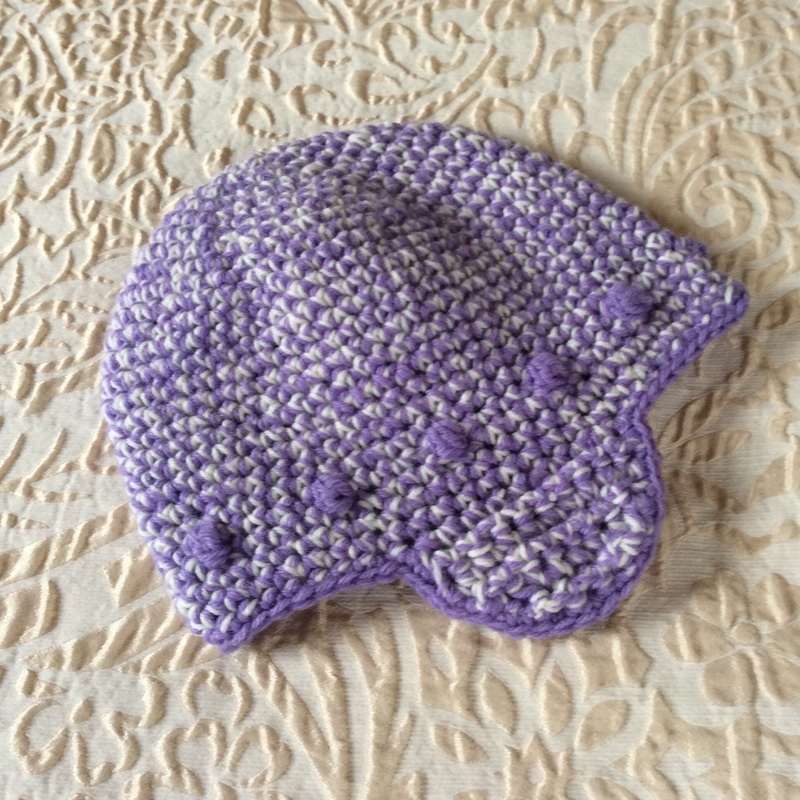 Since my first project and my Tunisian crochet samples had not been returned I felt a bit uneasy about sending any further pieces of work. The good news is that she is now recovering from a nasty accident and I have got the work back. 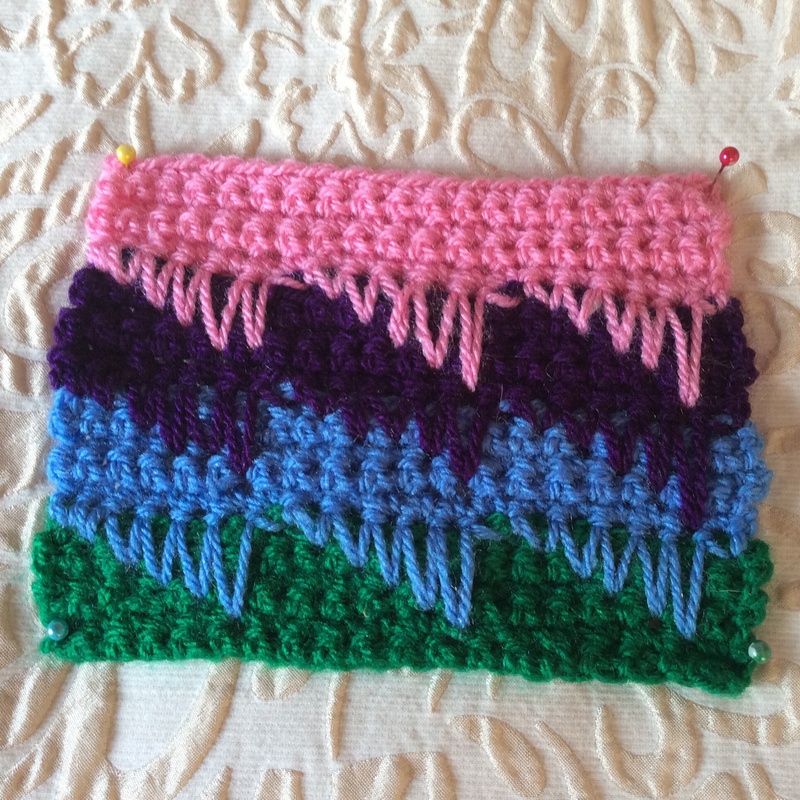 The fabric of the three Tunisian samples passed but there were some issues with the crab stitch edging on the two-coloured one so I shall have to redo it. Now I can get on with my plans for Project 2 which is almost entirely in Tunisian knowing that my basic Tunisian technique is OK.
Best news to arrive with the work was that the cardigan passed …. yay! 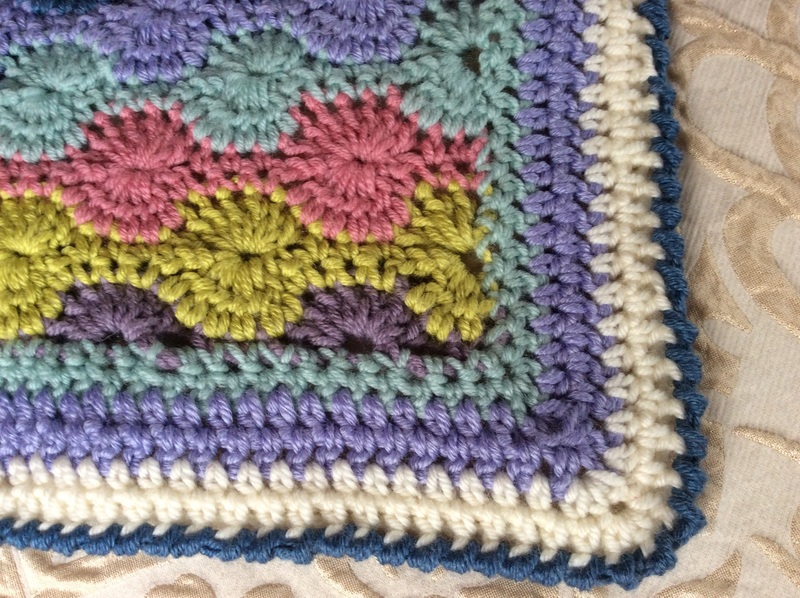 I had made more changes than are strictly allowed when using a commercial pattern but I got away with that because of an error in the instructions. Finding the mistake and commenting upon it as well as writing to the designer seemed to go in my favour … phew! ….. because I adapted the length and shoulder seam as well. Must say I am very relieved. Well, that’s quite enough for this morning. 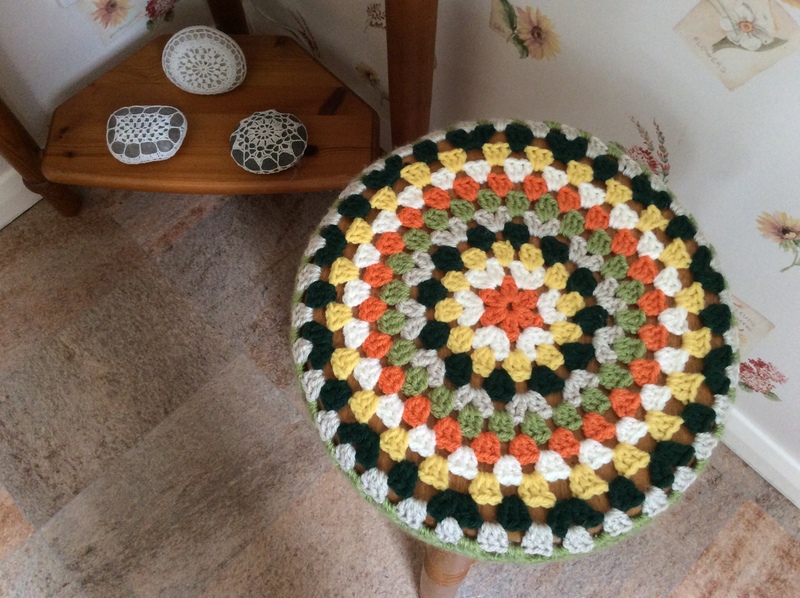 It’s quite busy in this household at present and I’m afraid there is not as much time for crochet activities as I would like. 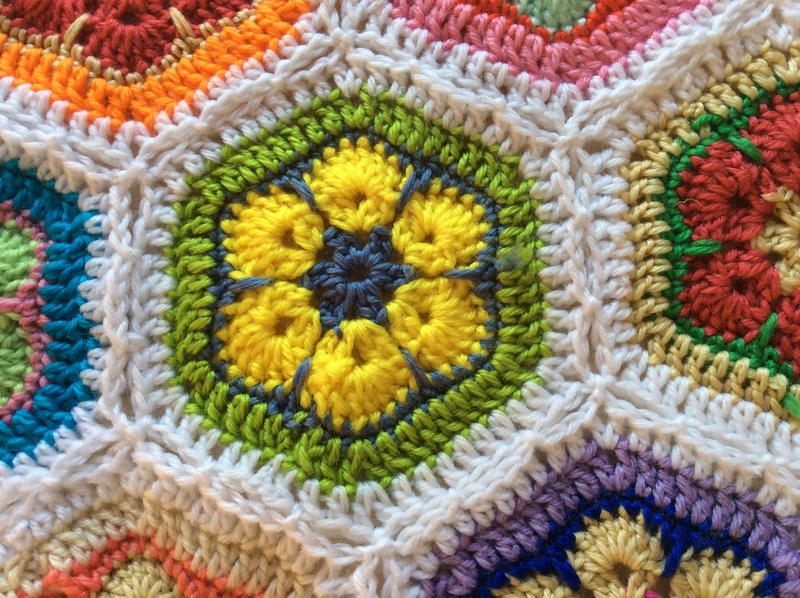 The summer months are just rushing by … let’s make sure we all keep a bit of time free for knitting and crochet! 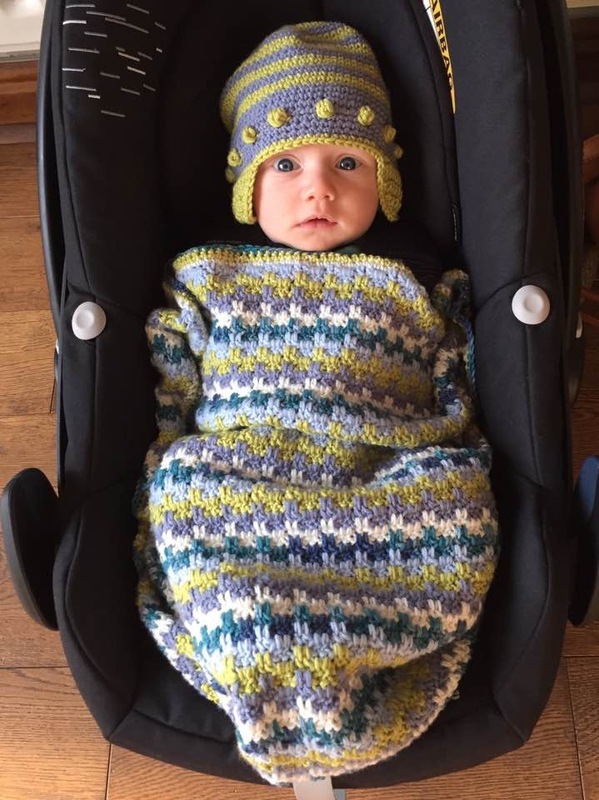 A new baby is always a reason to celebrate – to knit or crochet a favourite baby item. Phoebe Elizabeth is no exception and her arrival is very special. 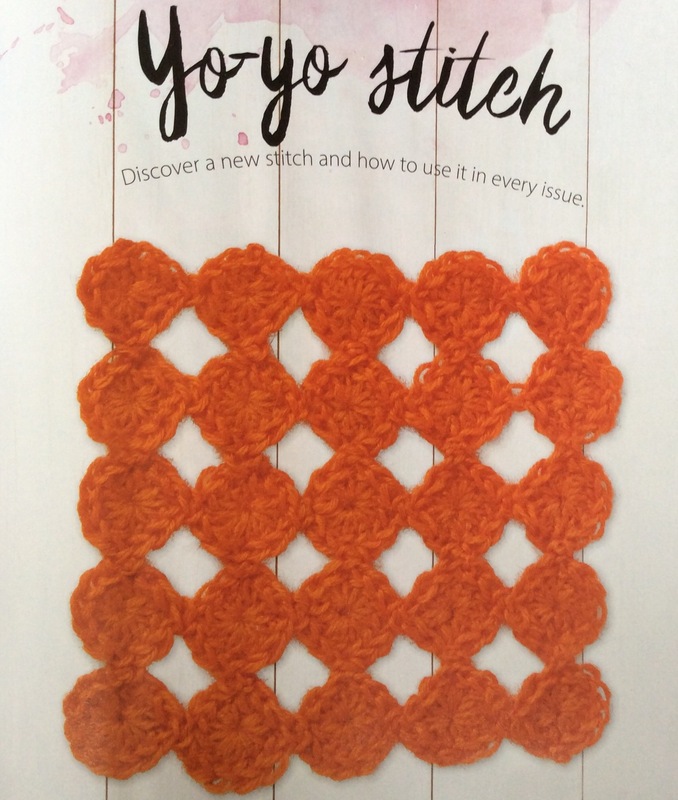 Am I alone in getting itchy fingers to try out new stitch patterns after doing the well-known ones a few times? 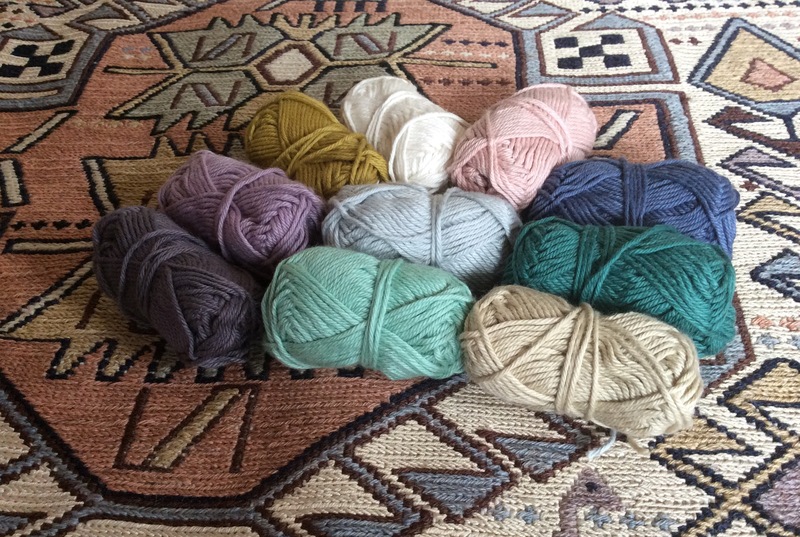 With a reasonable stash of merino and cash-merino baby yarns lurking in my stash I embarked on the never-attempted (by me!) 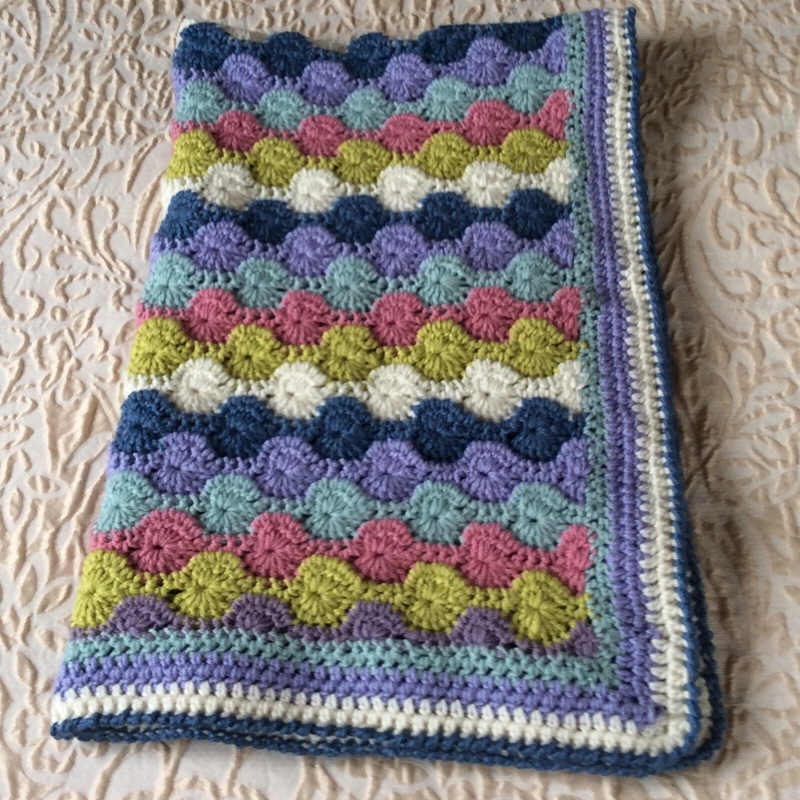 Catherine Wheel stitch of Little Doolally’s Penny Baby blanket. 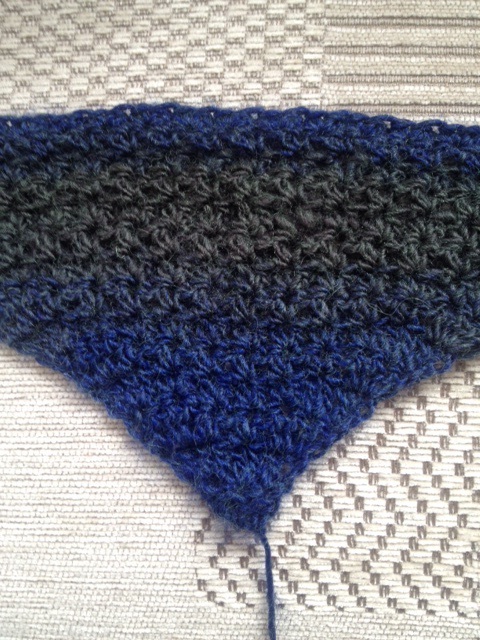 It took a little while to get the swatch to work and have reasonably straight sides and I have to admit to being a little fearful as to the outcome. 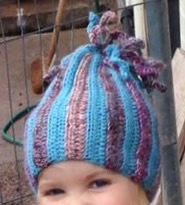 Once mastered, though, the stitch works well and is very effective in showing off bands of colour. 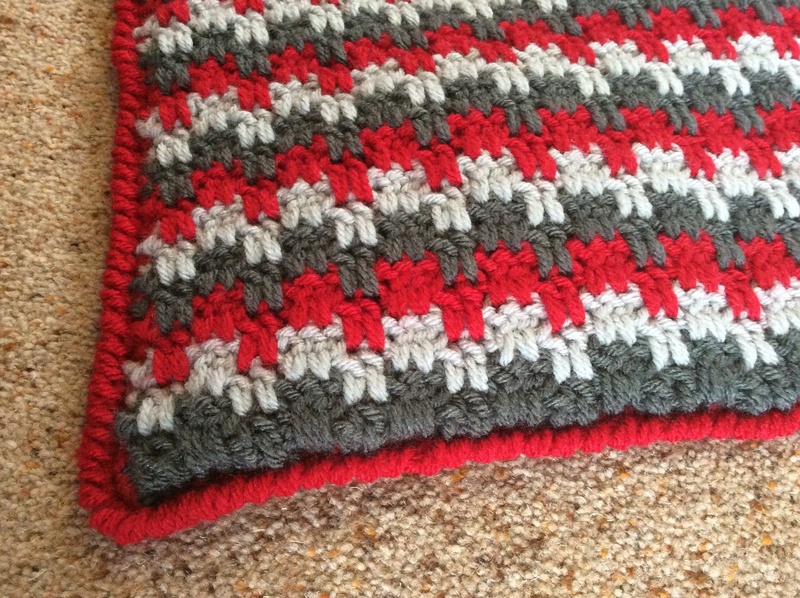 The edging too was a bit hit and miss and since the pattern suggested that it could be too full I was not surprised to find the central panel pulling inwards. 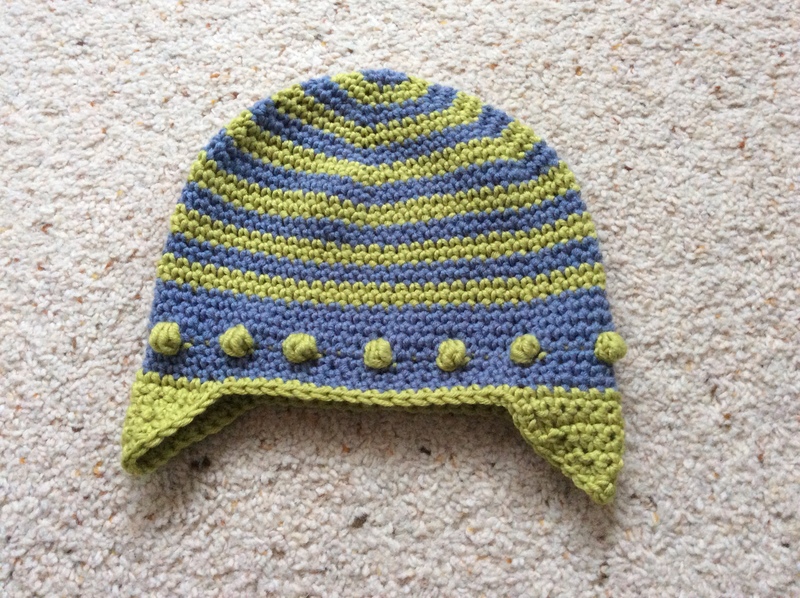 Ohh, the wonders of blocking ….. layers of towels, a hovering steam iron and patience over the weekend worked a treat and here is the finished article ready to be posted along with the little baby hat. All in all a very pleasing project and, though I say it myself, not a bad finish either. I hope little Phoebe and her Mum will enjoy it! Back soon with my next exciting project. No, ……… not what you put around gardens to protect them – in fact, it might have been a good idea if we had used some bearing in mind the events of the last few weeks! 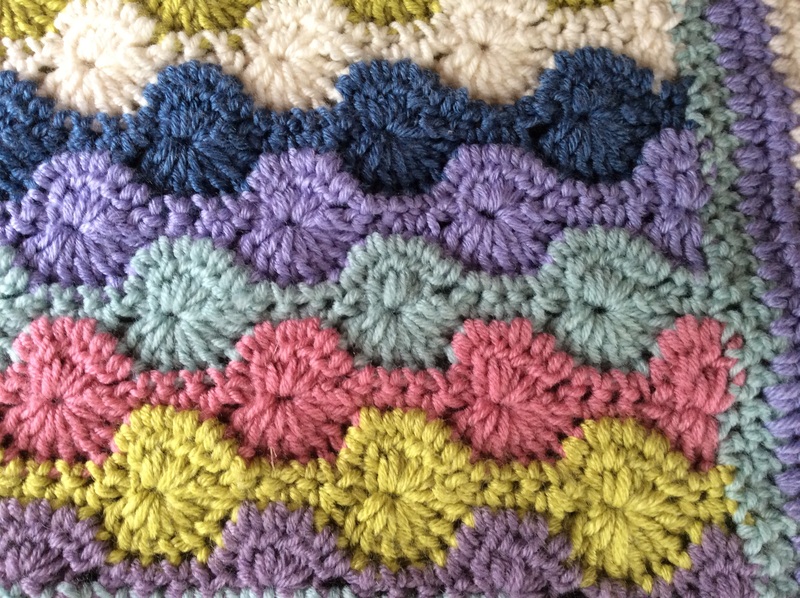 These are crochet terms for different stitches which you can use to add texture to your work. 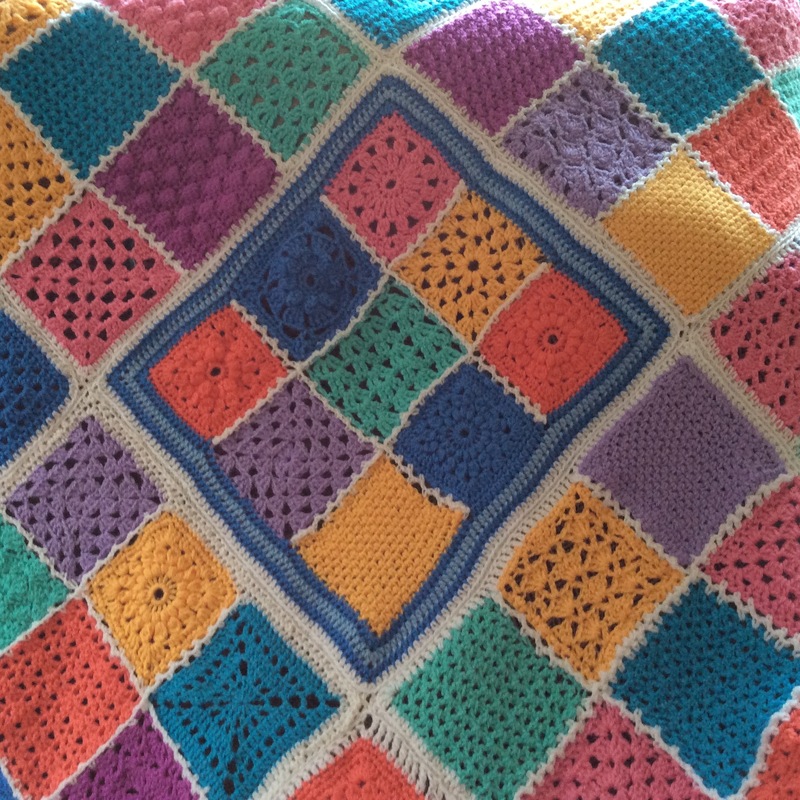 The effects of using spike stitches with different colour stripes is amazing and the technique is nothing like as difficult as it looks. 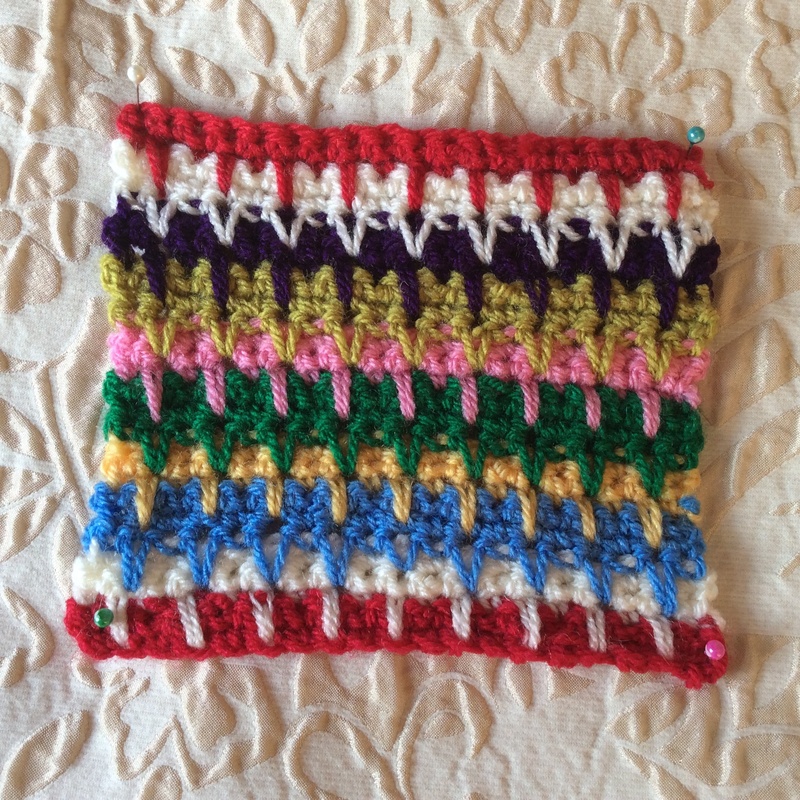 Double crochets and trebles are just worked by inserting the hook into a specified stitch or space below the row being worked at the time and drawing a longer loop of yarn up to complete the stitch. 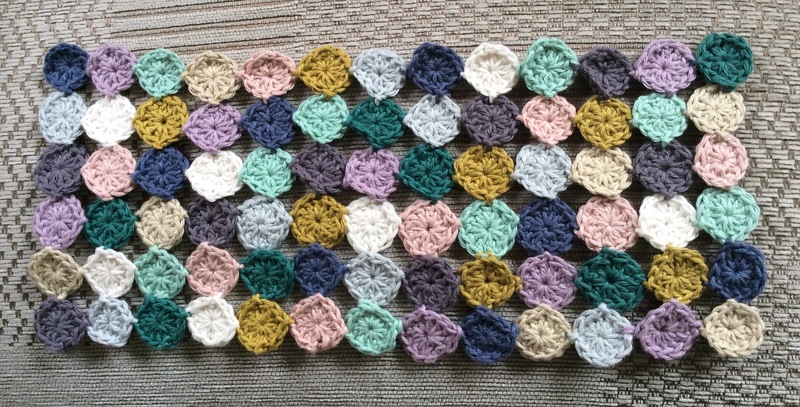 This is a most effective pattern which I discovered on Mooglyblog and works up a treat just by using the stitches a couple of rows below the row on which you are working. 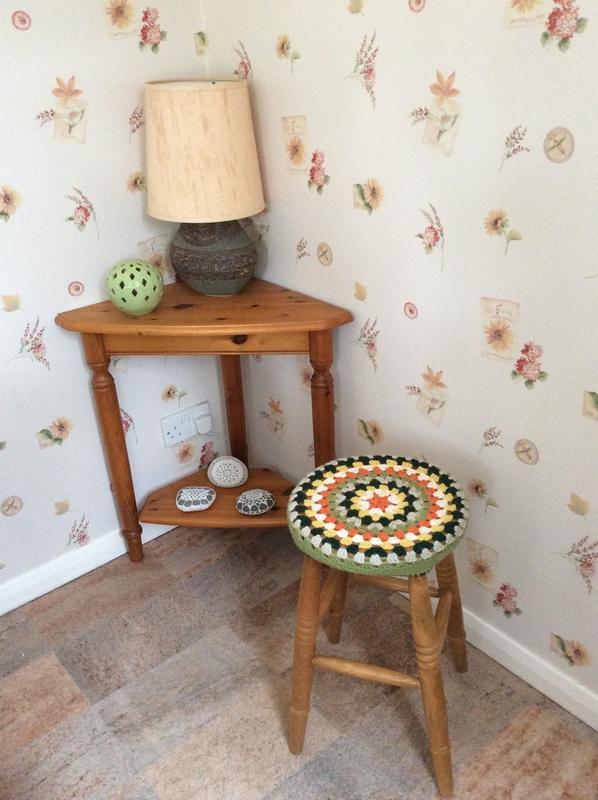 Check it out …. 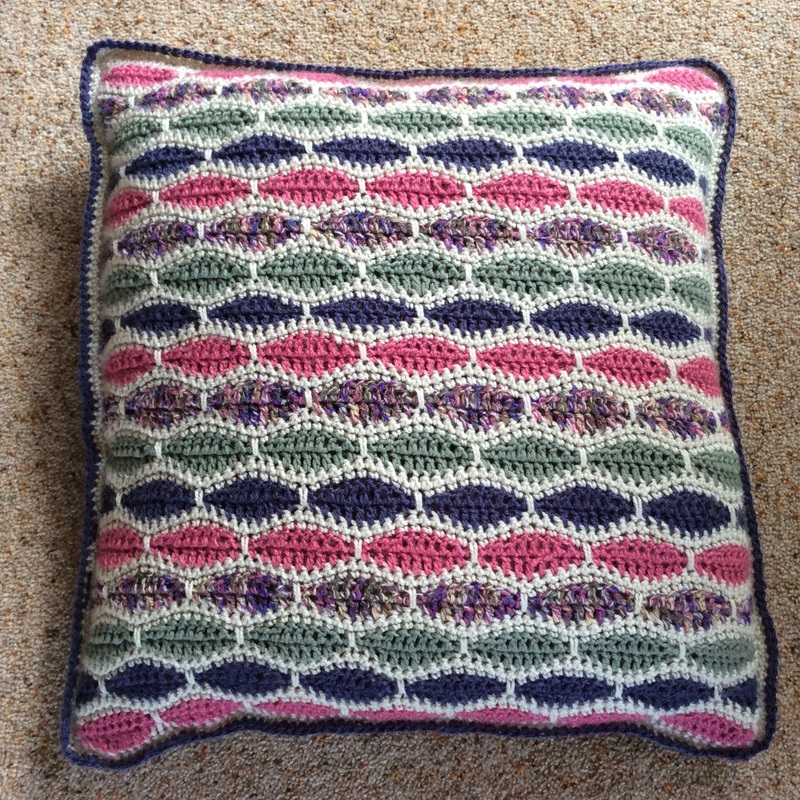 You might remember the cushion cover I did in this stitch a while ago. 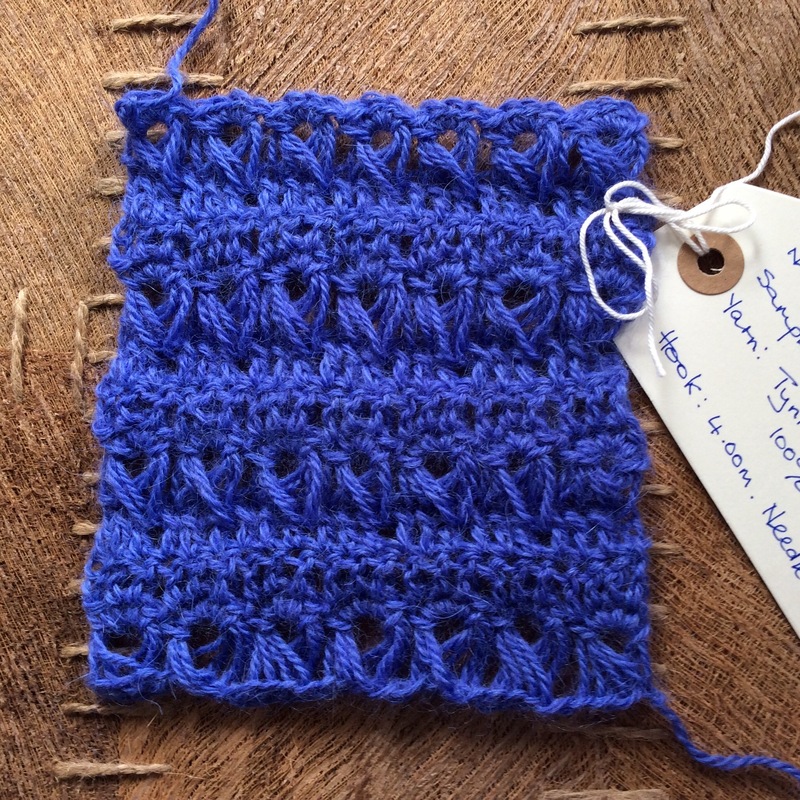 Eyelash – all sorts of variations on this exist by adapting the height of each spike stitch which is basically a very long double crochet. 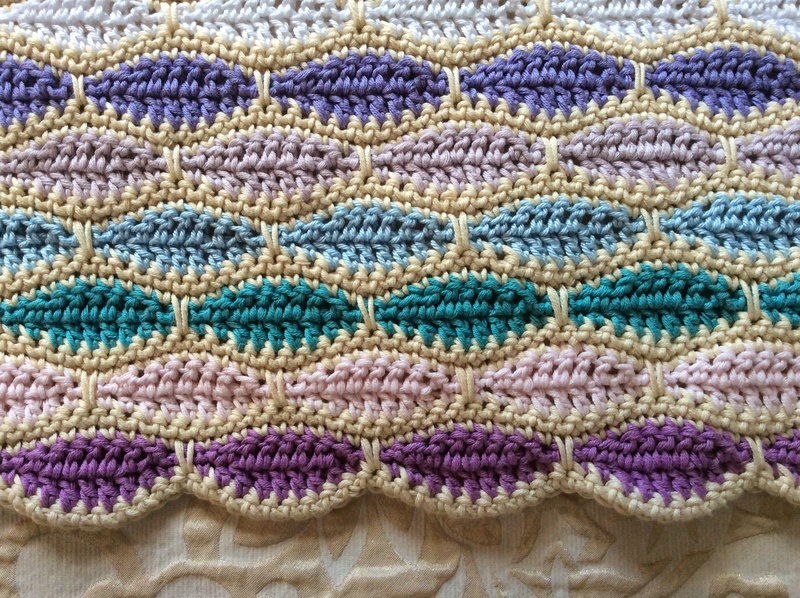 I love the calm, methodical design of this – each wave is defined by the spike stitch and once you become familiar with the ten stitch repeat pattern it works a treat. 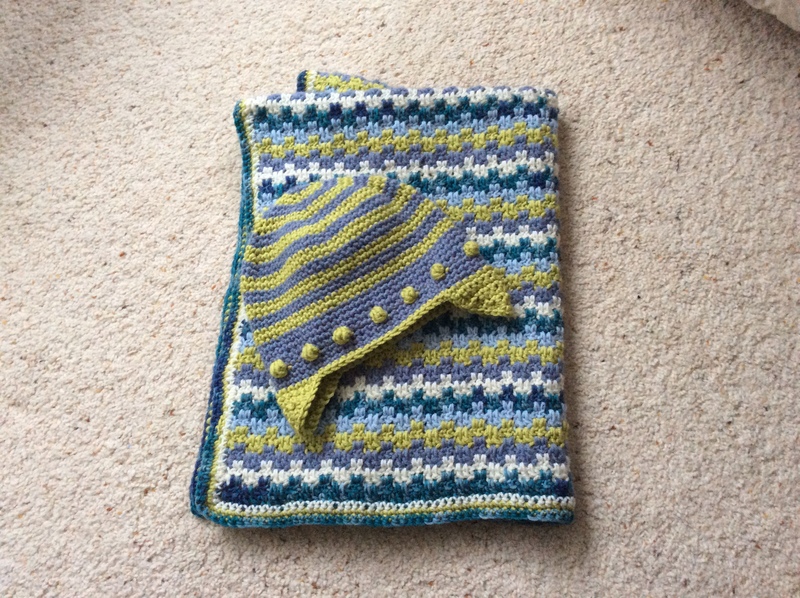 My example is going to be a baby buggy blanket but I have seen it worked in beautiful textured wool yarns to produce a fabric which would be perfect for a cushion cover. 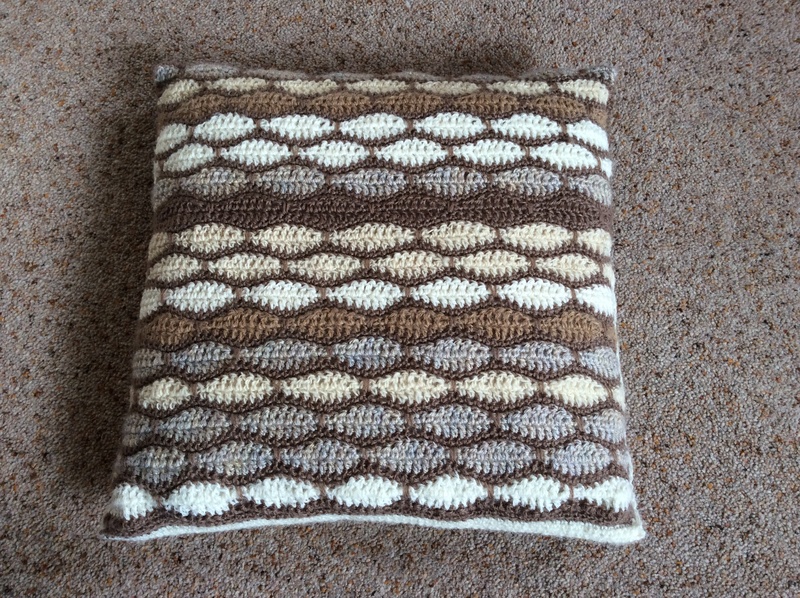 ……….. or a cushion cover. 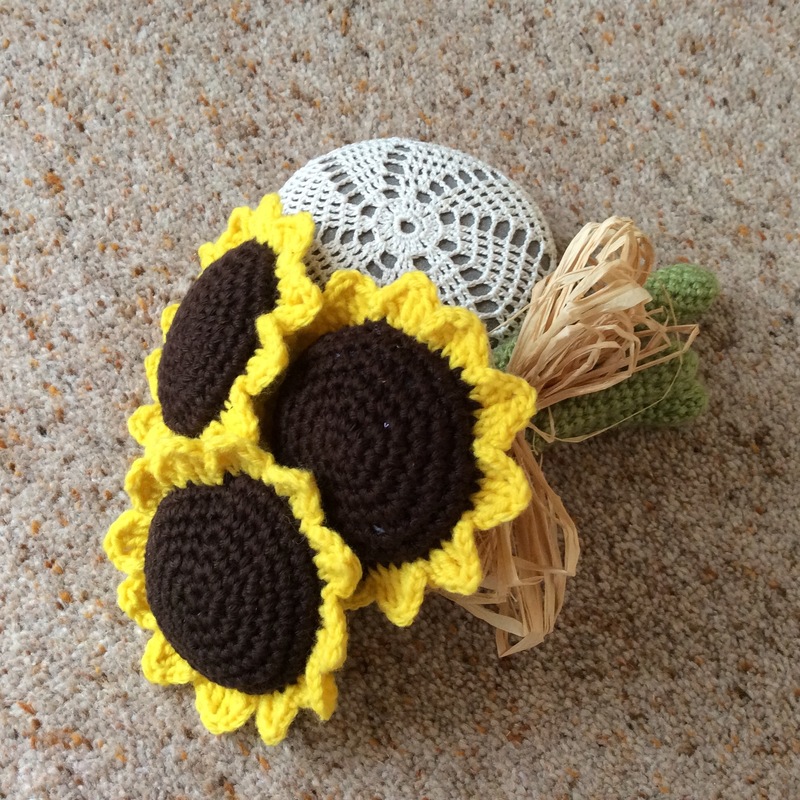 This design has been beautifully worked by one of my lovely crochet ladies. You can see why they fill my Monday mornings with joy! 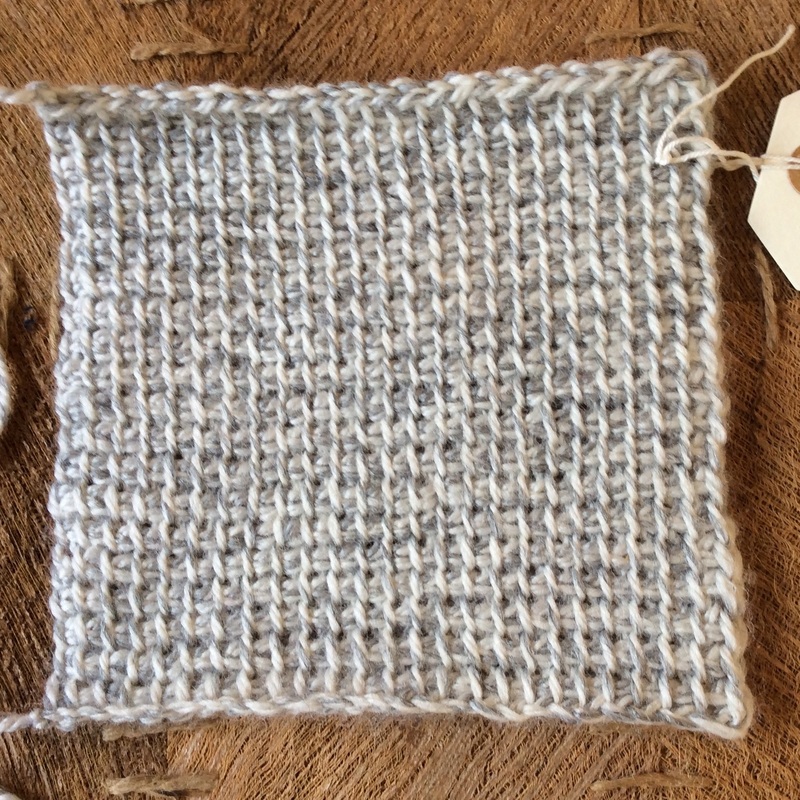 what a difference the wool makes to the appearance! 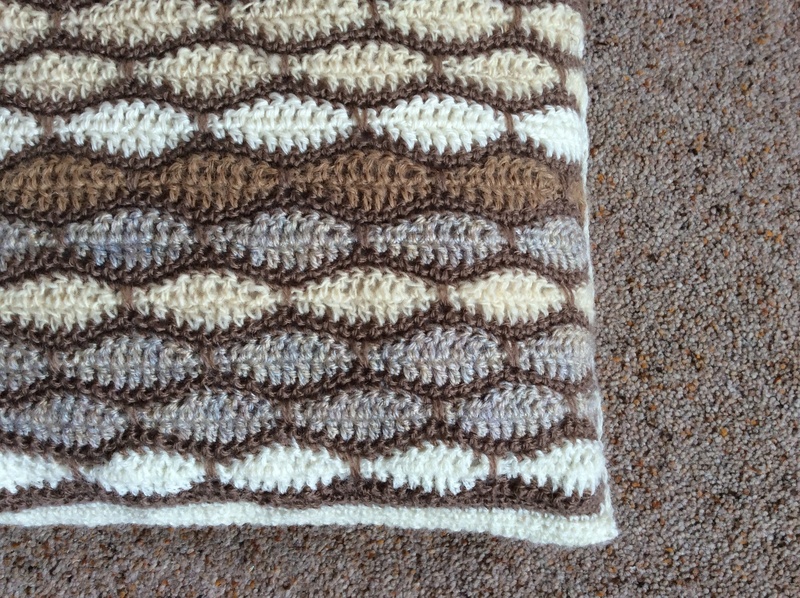 My choice of stitch name for this design as I could not find it described anywhere. 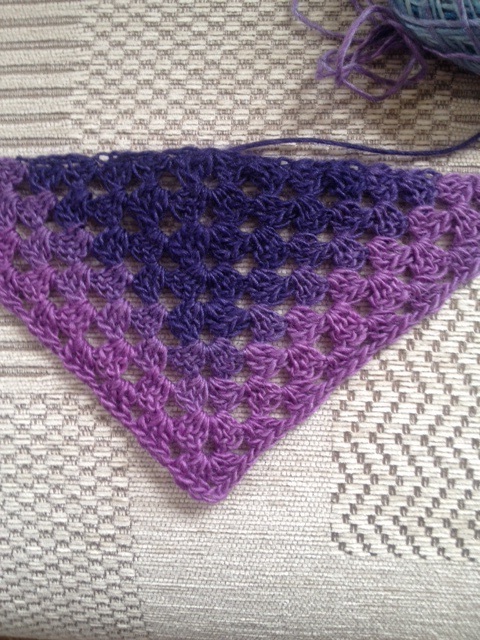 There is a good visual tutorial for it on the mypicot website. 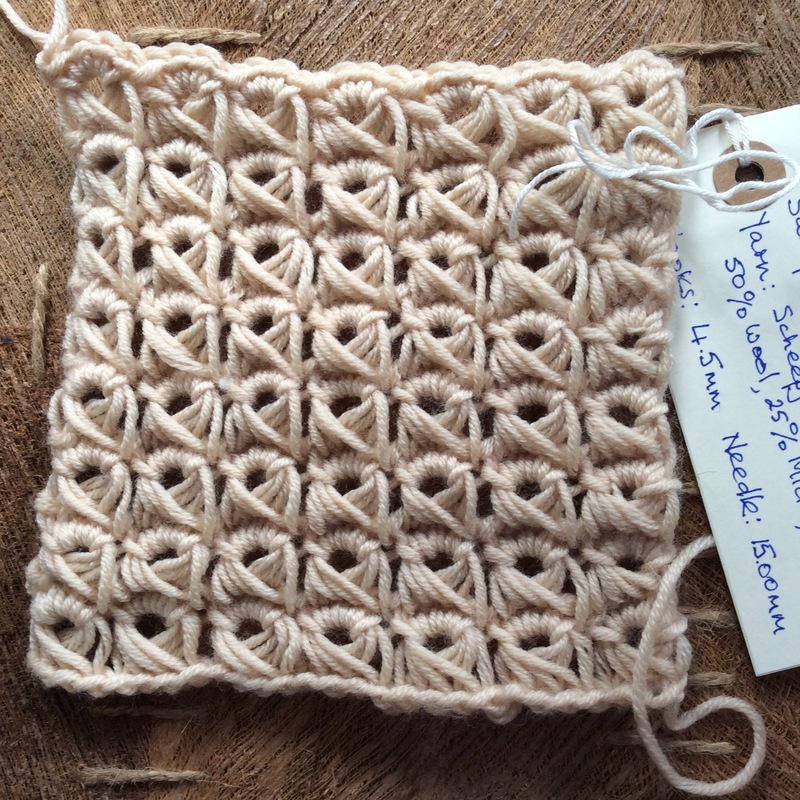 The same method of working into stitches below can be used in the round as well to produce striking motifs ……. 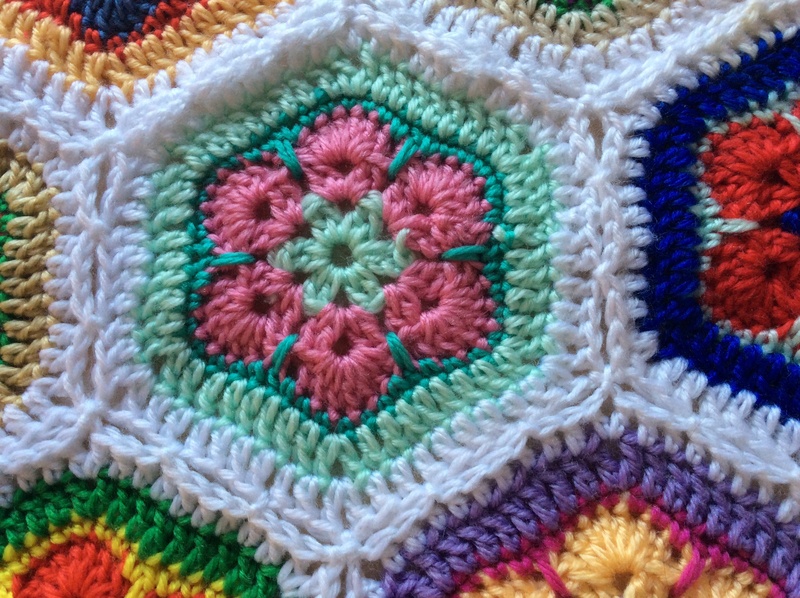 separating petals with the spike stitches or just incorporating colour spikes. Not all of the above examples qualify strictly as spikes but hey, I like them and the effects they produce. What inspires me as well is the diversity of trying out these stitches with different weights and types of yarn and not being afraid to experiment with a whole range of hook sizes. 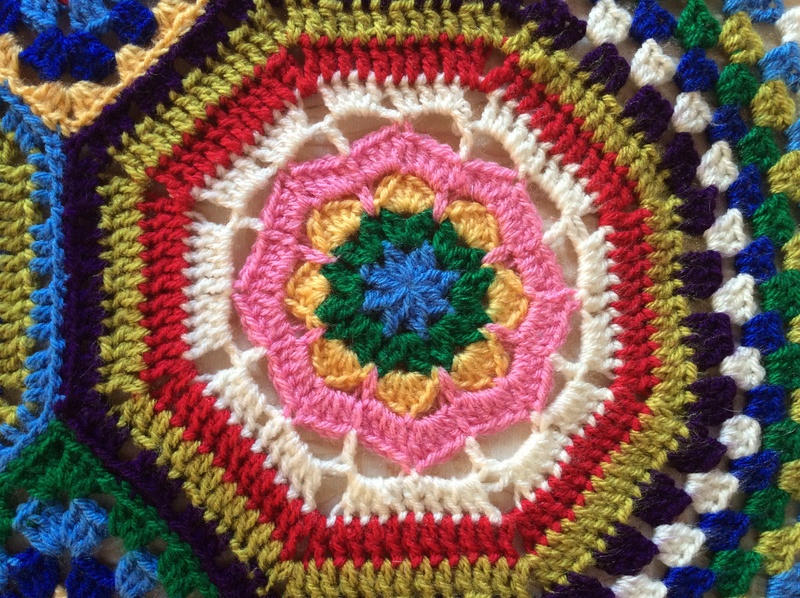 Oh for a few more crochet hours in each day …….. and I haven’t even started on posts yet!